I was kindly sent this a wile back but with everything going on baths and a good pamper were a rare thing so for 2016 I have began to use it and oh wow its the most perfect set for this time of year. This gorgeous set is the most fantastic set for him and her. So perfect for anyone to use and just relax with, this trio is 3 steps to scrumptious skin you have your body wash, scrub and lotion all in the same divine scent. It is a set to refresh, exfoliate and nourish the skin and I bet you didn’t know this is the brands signature scent! Considering how much Molton Brown I have tried over the years I had never tried this nor did I know that! This scent is so different its aromatic and strong with the ginger but yet light all at once making it a real transitional range from summer to winter and the in-between. I love the body wash and lotion but the Body Polisher is a game changer it is rich and really exfoliates all the nasties and leave the skin feeling so silky it has micro-exfoliating Tahitian sand in it that gently massages your skin while the gel transforms into silky milk for flawless, blissfully soft skin. The body wash doubles as a bath and shower gel so if you just want to sit in some bubbles and relax a dash of this will lather up and the scent will fill the room. What makes this range is the spicy undertones of ceaderwood and the while lily extract it makes it deep yet refreshing when paired with the kick of ginger. To really finish off your pamper session you need the body lotion I think it just leaves a lingering scent on the skin and the handy pump bottle makes it really easy to apply. It sinks in really well and you don’t need ampules and ampules of product to get results. It seriously it a pamper session in one box but if you want to keep going you can get the hand create, diffuser and candle to match I mean cummon! Its rich and luxurious and why not fill your bathroom or bedroom with this blissful scent. 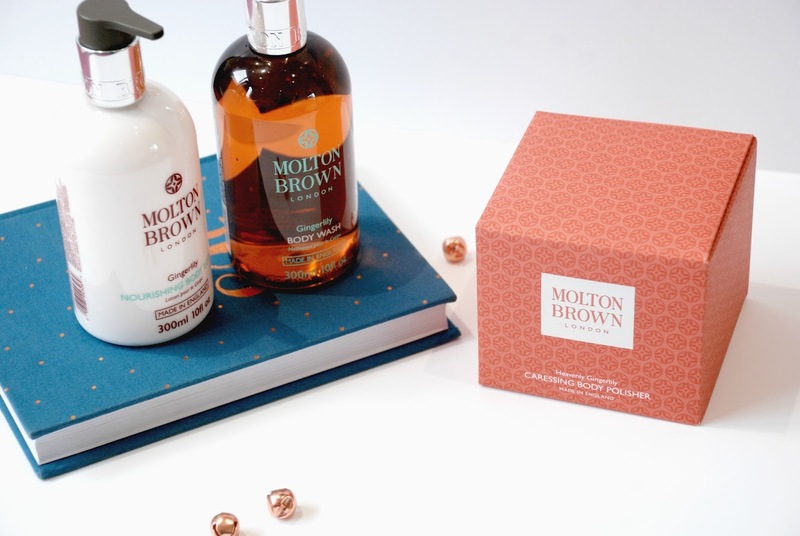 What is your favourite Molton Brown Scent?